There are many companies in the LMS space, each offering products designed to power up instruction and effectively help districts meet their needs. To maintain sustainability and gain a competitive edge, LMS companies must help educators adapt to rapidly changing demands by piecing together powerful teams of support to promote engagement and growth. New product features and integrations combined with personalized client support, purposeful professional learning, and leadership development will be the key to district-wide adoption and growth. The winning teams will be those with educators in key positions who fundamentally understand the needs of teachers and the challenges of new product implementation. Innovation and talent will continue to spark transformation, stemming from dedicated communities of expert educators leading the way and putting the power of the LMS to the test at the heart of the learning environment. The LMS provides the building blocks to engage all learners in a variety of experiences to meet their diverse needs. Data collection and assessment features provide educators with the tools needed to personalize learning and develop strategies to increase student growth. Alignment to standards and goals combined with collaboration encourages district-level curriculum development to target instruction and create a repository of resources. Ease of modifying digital content for specific needs provides instructors with the power to customize content without the need to build it from scratch. 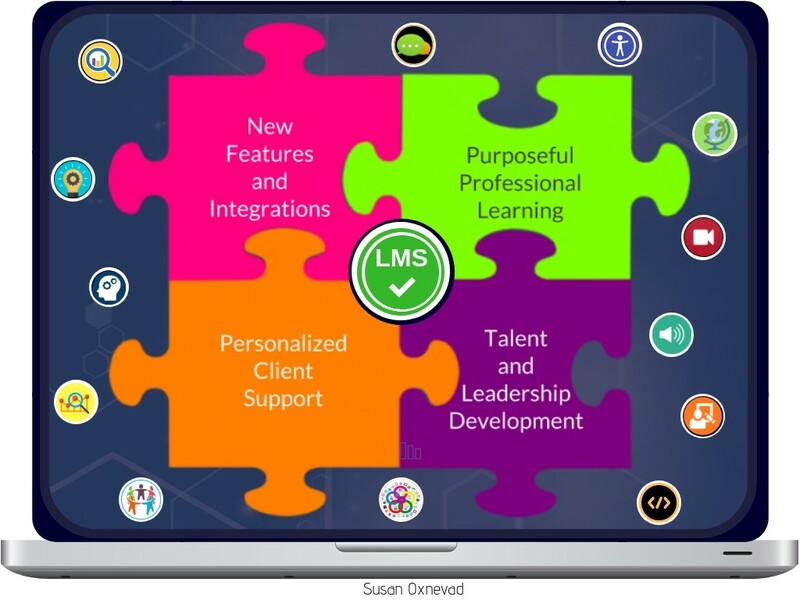 Flexible LMS platforms also provide a place for inventions and innovation, opening up the possibilities for seamless integration with a treasure trove of the newest and best 3rd party education tools. The potential for student engagement and creativity is abundant as educators move through the stages of tech integration and gain confidence in their ability to design creative student learning experiences. Innovative use cases will continue to raise the bar as more districts put the tools to the test. With many K-12 and Higher Ed organizations in the early phases of implementation, the LMS market is wide-open. This creates abundant opportunities to transform teaching and learning through collaborative relationships designed to combine in-house talent with powerful teams of support on the LMS side. The most successful teams will be able to develop engaging personal learning plans powered by purposeful professional development to leverage the power of the LMS while working collaboratively towards shared goals. With the pieces in place, organizations will able to successfully achieve goals, and many will strive to find ways to kick the learning up a notch. With a carefully crafted and personalized plan, the transition to the LMS will foster the development of materials, resources and teaching strategies that align with instructional goals and help busy educators compact their crowded plates. Educators will become empowered by the ability to modify and customize curriculum to meet the needs of all students, and they will be motivated to keep learning. Buy-in will increase as educators learn to use the data to inform instruction, resulting in student growth. Early adopters will lead the way in designing learning experiences that allow students to collaborate, create content, and share, providing them with opportunities to develop the higher level thinking skills necessary to be successful in a global society. These educators will be quick to combine the power of their favorite tech tools with the LMS to maximize engagement and reach new levels of learning. As K-12 and Higher Ed move forward in LMS adoption, the platforms powered by talented, forward-thinking teams who are dedicated to effectively helping educators meet the challenges of the fast-paced educational landscape through close collaboration powered by purposeful professional development will have the greatest impact on transforming teaching and learning for the benefit of all stakeholders. There are exciting times ahead for the teams with the pieces in place!